When you hear the words "lead poisoning," you might think about old paint or bad water pipes. But what about gun ranges? "A job came open that seemed to be a good fit for me,” said Don Haines from northeast Ohio. He has a background in law enforcement, so a local gun range hired him. “My best fit would be to be the Range Safety Officer,” he said. Haines said that there were weeks where he was at the range six or seven days a week for hours at a time. It all had an impact. "I would be driving up the highway and it's like it was almost physically difficult to keep my eyes open,” Haines said. Doctors eventually discovered Hanes was suffering from lead poising. "Current lead contamination still has tremendous impacts to a bunch of different sectors,” Dr. Gabriel Filippelli the director of the Center of Urban Health at IUPUI in Indianapolis said. Filipelli says that when guns are fired at a range, lead particles get left behind on walls, counters and floors. Plus, many times the primer used as padding to eject the bullet is made of lead, and that bursts into the air. "You have to remember that the primer is exploding right by people's faces, particularly if they're using rifles," he said. Filippelli lent his talents to a national study of blood lead levels in people who frequent gun ranges. While healthy adults should have far less than 10 micrograms of lead per deciliter of blood, Filipelli and his colleagues found that those who frequent gun ranges had lead levels ranging from 10 to 20 micrograms per deciliter. Some even had up to 40 micrograms per deciliter. "It's really hard to find a single study of someone who uses a firing range that said, ‘Oh, no. They're completely fine.’” Filippelli said. Medical experts from the National Institute of Environmental Health Sciences said "no amount of lead is safe" in your body because even a level of 10 can cause significant problems for kidneys, blood pressure, and the nervous system. But, the federal Occupational Safety and Health Administration , or OSHA, is in charge of inspecting gun ranges and lead levels in 28 states. OSHA says people can still work their jobs when their blood lead level is 40. "(That) is well over what we now think causes reproductive effects, which is 25,” Pete Dell said. Dell is the president of the Dell Group , in Mentor, Ohio, which has been helping businesses and agencies mitigate lead problems for the past couple decades. According to Dell, the so-called “safe” levels used to be much higher than they are now. “One of the scariest things about these ‘safe’ levels that we get from HUD, from EPA, from OSHA is they're always dropping,” he said. Meaning, who knows what kind of damage was left behind by allowing businesses and policies to have higher, more damaging levels back then. Filippelli, too, said the "safe" levels are out of whack. "These levels are so high, that they're starting to have impacts on the adults ... including things like depression, suicidal thoughts, aggression," Filippelli said. When Haines was first hired at the gun range, his blood lead level was recorded at three micrograms per deciliter. But just eight months later, it was 20 times higher — 60 micrograms per deciliter. “It's always time for OSHA to do more,” Filipelli said. "I would argue that they're not doing enough." OSHA declined to make officials available for an on-camera interview. But in a written statement, OSHA revealed it might finally be more open to lead-experts concerns and do more to protect workers. OSHA cited numerous experts that said lead levels in adults should be less than 10 micrograms per deciliter. And OSHA said it's "…exploring regulatory options to lower blood leads in affected workers." Read OSHA's entire statement at the bottom of the page. 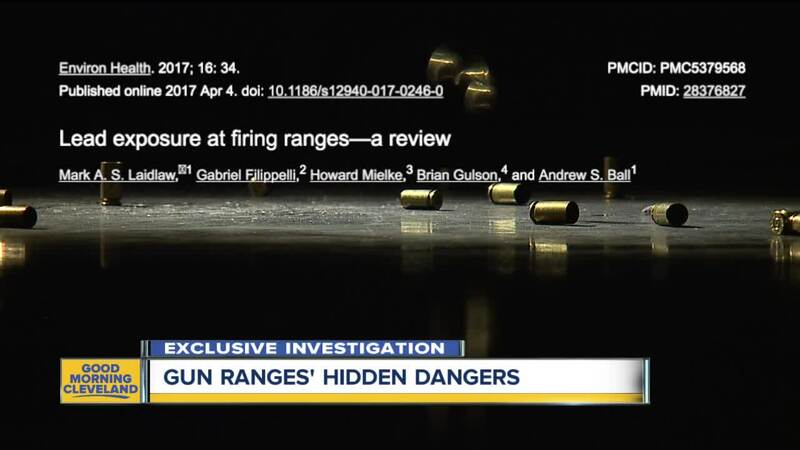 While the bureaucratic process slowly churns, it's important to note OSHA only did 15 inspections of gun ranges in all of Ohio in the 5 years. The highest fine was against Pro Armament in Cuyahoga Falls, Ohio — which used to feature a gun range along with its shop. OSHA fined the company $80,000 for high lead levels, but that fine was negotiated down to just $23,000. Pro Armament declined to comment. Gun ranges can protect shooters from lead poisoning by installing proper filtration systems that blow air away from shooters and towards targets. Experts said shooters can also protect themselves by wearing masks when shooting or work at a range, wearing gloves while firing or cleaning up, and washing the clothes worn to the range separately other clothing. “That's going to contaminate the laundry equipment at home, the rest of the family's clothes,” Dell said. “You don't want your toddler playing with your work boots that you spent all day with lead dust on them." Filippelli said he wants to give businesses and government agencies information about protection and possible consequences. Haines said he didn't know about the dangers of lead poisoning when he was hired to be a Range Safety Officer — a job he took to help other shooters. "They could go for years and they may not recognize any symptoms,” Haines said. "Had I not had someone who was observant, I probably would not have attached it to the lead." That state of Michigan just lowered its lead level threshold . Workers may not return to work unless their levels are 15 or lower. Click on this link if you would like to file a complaint with OSHA. Read OSHA's entire statement below. “The Occupational and Safety Administration is working diligently to protect America’s workers. OSHA is actively exploring regulatory action to strengthen the standards for blood lead levels in affected workers, as noted in an announcement made this past fall. In fact, yesterday OSHA cited an indoor gun range for penalties totaling $214,387. OSHA also notified the public health department to alert customers about the elevated lead levels in this range. In addition, the agency recently updated a QuickCard to educate workers and employers on protecting themselves from hazards of lead in indoor firing ranges. Enforcement plays an important part in OSHA’s efforts to reduce workplace injuries, illnesses, and fatalities. All complaints made to OSHA will be investigated, and employees may request anonymity when they file complaints. The agency seeks to focus its inspection resources on the most hazardous workplaces in the following order of priority: Imminent danger situations, Severe injuries and illnesses, Worker Complaints, Referrals, Targeted Inspections, and Follow-Up Inspections. For more details, please see OSHA’s Fact Sheet on Inspections.